Yet another task was accomplished over the weekend. I went through all the containers and matched them with lids. This is most of what I have. Now comes the decision on how much I really need to save. The green container I have had for a good 25 years. That's the thing about Tupperware. I'm inclined to keep it simply because it's lasted so long and shows no sign of wearing out. It seems to me that I might have culled this group about 5 years ago. 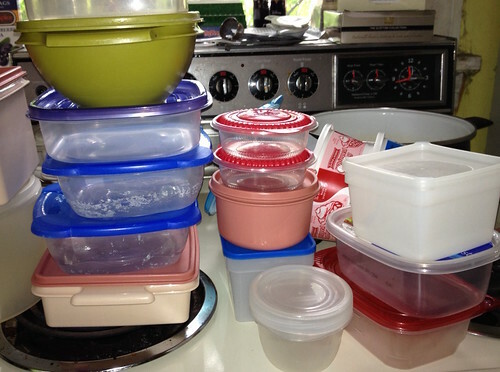 In that time, new plastic containers have been released. It's easy to be seduced by the shiny goodness of plastic storage. But I have to be ruthless here. I just can't save everything. I need to be realistic in how much I actually store. Why is it so hard to part with this stuff?